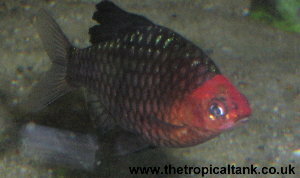 A male Black Ruby barb in breeding colours. Tank setup: Planted tank with some open swimming space, avoid overly bright lighting, or provide shade with floating plants. Compatibility: A lively but normally peaceful community fish. Keep in a shoal. Feeding: Omnivorous, most foods accepted, include a vegetable component in the diet. Sexing: Breeding males show the intense red/black colour (see photo) and tend to be a little larger, though females have a thicker body shape. Breeding: For spawning, water should be soft and at the higher end of the temperature range. Spawning usually takes place in the morning, with the eggs being scattered among plants. The adults will eat the eggs if given the chance. Eggs hatch in about 24 hours and the fry become free-swimming several days later. Comments: Juveniles have a colour and striped pattern similar to the Tiger barb, but breeding males change colour quite dramatically, as shown in the photo.